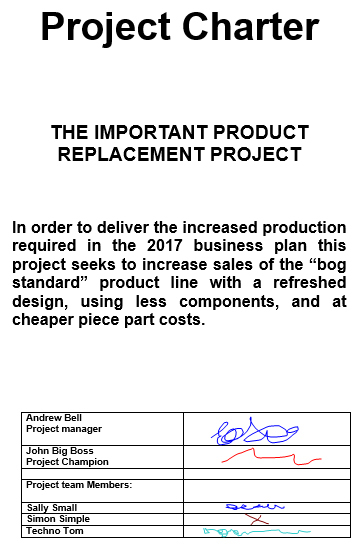 Getting the Project Objectives clear in a ‘Scope’ document is essential. Establishing what is to be done on the project ‘In-Scope’ and what is not to be done ‘Out-of-Scope’ is vital in communicating the purpose of the project. ‘Scope Creep’ is a big problem on projects, and communicating the project specification is essential. This blog will look at the contents of this document, providing a rough template and examples of the information that needs to be in a Project Initiation Document (PID). I will explore a couple of these before looking at the contents. A focal point for all of the information on the project. Starts with the business case – the business reason for the project. To ensure that the project has a sound basis before asking the Project Board to make any major commitments to the project. To act as a base document against which the Project Board and Project Manager can assess progress, change management issues and ongoing viability questions. The PID is the what, why, who how, and when of the project. The PMP is the output of the definition phase of a project or programme. This ‘output’ is therefore a clear definition of what the project is all about. The content of a PMP clearly depends on your project, the scope of work, and your responsibilities. Easy projects (Runner projects) may have less detail (or will copy previous PMP templates). More difficult projects (Stranger projects) will need more detail in the plan. How much is the total project costing, and how much does each phase cost? Where is the funding coming from and how the business can manage its cash flow during the development period? It will allow the group of people assigned to the project to start to align to the project objectives and become a team. It should provide enough information for a high level WBS to be created. The PMP will develop through the life of the project, as new information is discovered, and changes are applied. What is Unknown – any uncertainties or unknown issues. Once these are stated, there can be no doubt that they are unresolved issues. What is NOT in the project. Explicitly stated, may be similar to “out of scope”. These are important sections to avoid confusion and misunderstandings. The PMP technical chapters will depend on the type of project. A software project may have detail on database versions, operating system versions, and modules. A construction project may have details on the types of materials etc. SharePoint Systems can be used – but not everybody on the project may have access. Make sure that you issue control the document, with a clear version number on the front cover. You need the team and stakeholders to read the document – so make it readable. All of these will encourage those on the project and the team to read the document. It is the people who will deliver the tasks on the project, so their involvement and understanding regarding the project scope is vital. Scope Creep is a major reason why projects fail. Defining the purpose of the project is vital, and that is the purpose of the project charter, specification, management plan, initiation document.